With the second season of NBC’s smash hit This Is Us wrapping up Tuesday night, B&Cpartnered with Inscape, the TV measurement company with glass-level data from a panel of more than 8 million smart TVs and devices, to take a look at viewer trends across the most recent season with a particular eye to how the special post-Super Bowl episode affected viewership. 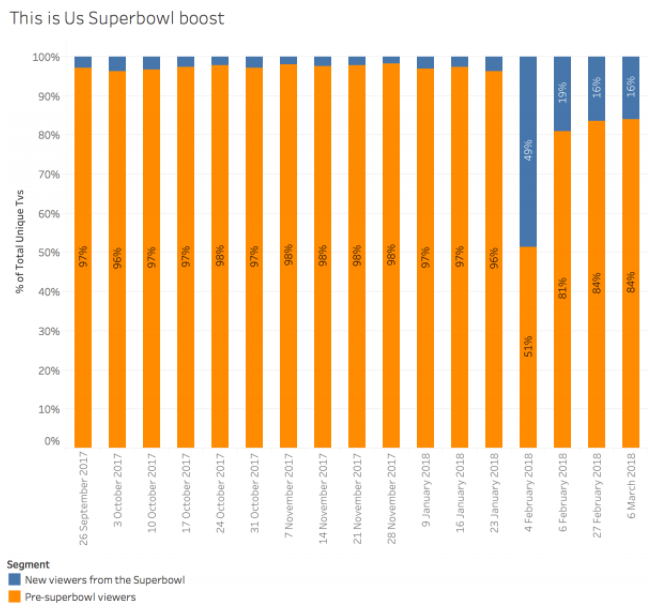 Tune-in has been mostly steady throughout this season, with the biggest spikes happening during the premiere and after the Super Bowl (note that because the Super Bowl ran over its allotted time slot on Feb. 4, the biggest spike in the graph includes some spillover viewership from the game). 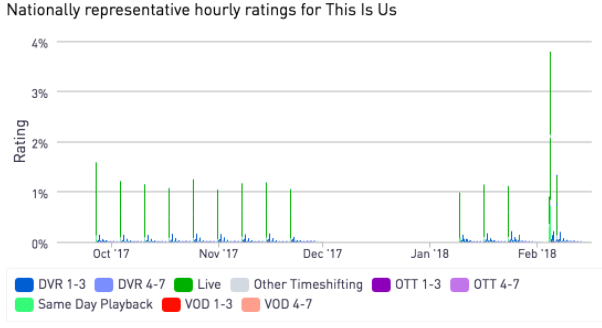 As you may expect with any breakout hit series, many people watch This Is Us live, but there’s healthy DVR and OTT viewership as well. Interestingly, the more episodes that a household watched the more likely they were to watch live instead of time-shifted. Other shows watched by This Is Us-viewing households include Ellen’s Game of Games, Chicago Med, The Wall, The Voice and Chicago Fire. 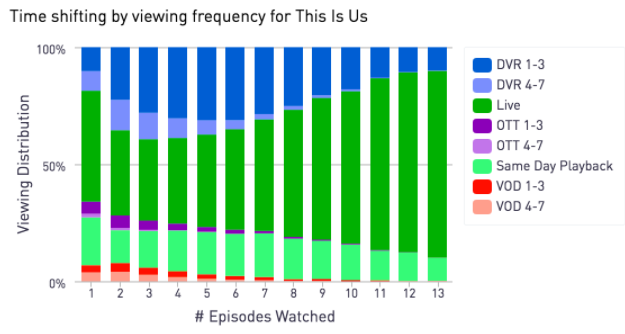 That’s good news for NBC, because all of those shows air on NBC, suggesting that strong viewership for This Is Us may be giving a lift to other series in the network’s lineup.